I’m still waiting to hear a Republican leader say something about the most obvious lesson of the just-completed presidential election: Republicans need to mend fences with black voters. Since the election, leading pundits and political commentators, like far-right columnist Charles Krauthammer, have acknowledged the need to change Republican rhetoric on issues such as immigration. As syndicated columnist Ruben Navarrette Jr. noted, Republicans must stop describing all Latino immigrants in broad-brush terms as “takers,” not contributors to the nation. In other words, you can’t expect that people you or your talk-show proxies insult will vote for you. But apparently the same logic doesn’t apply to black voters. Black voters cast a ballot for President Obama over Republican presidential candidate and former Massachusetts Gov. Mitt Romney by a 9-to-1 margin—a significantly bigger disparity than Latino voters. In some largely black and urban areas, Gov. Romney failed to get even a single vote. But in all of the postelection analysis, I’ve discerned precious little interest in a Republican outreach to African American voters. I fear the party has sadly concluded that black voters are totally beyond its grasp. If so, they may be hoping to cleave a slice of the Latino voting populace. In effect, the GOP hopes such a plan would produce a majority in presidential elections by finding common ground with enough Latino voters who would be acceptable within their bloc of white and Southern voters. That, in turn, would leave black and urban voters entirely to Democrats. This isn’t a far-fetched idea. The formula for this transmogrification was noted in historian Noel Ignatiev’s classic book, How the Irish Became White. Ignatiev’s work documents how deliberate political moves early in the 20th century allowed some European immigrants to shed an undesirable status by separating themselves from and displaying overt hostility toward a more despised other: black Americans. Such a view seems to be supported by the drumbeat of bad news in the weeks following the election regarding the GOP’s relationship with black voters. GOP leaders seemed to have doubled down on insulting and isolating black voters. Last weekend The Palm Beach Post reported GOP activists in Florida passed laws claiming to combat voter fraud, although in reality these laws were intentionally meant to inhibit traditionally Democratic voters. The report gave a lift to widespread fears among many voting-rights observers who suspected GOP activists were working to prevent black voters from exercising their franchise in the state by passing the law, which contributed mightily to long lines and forced some people to abandon voting entirely. Rather than courting black voters, it seems some in Florida would just as soon block them from voting at all. The newspaper also reported that former Republican Party of Florida Chairman Jim Greer said he attended meetings beginning in 2009 where party officials pushed for the law to limit Democrats in general and black voters in particular from voting early and in large numbers. “The Republican Party, the strategists, the consultants, they firmly believe that early voting is bad for Republican Party candidates,” Greer told the Post. “It’s done for one reason and one reason only. … ‘We’ve got to cut down on early voting because early voting is not good for us,’” Greer said he was told by those staffers and consultants. Then, of course, there’s another strategy. Even when some accomplished black leaders rise to prominence, there are some mossbacks seeking ways to discredit them. How else to explain the tag-team dissing of U.N. Ambassador Susan Rice by Republican Sens. 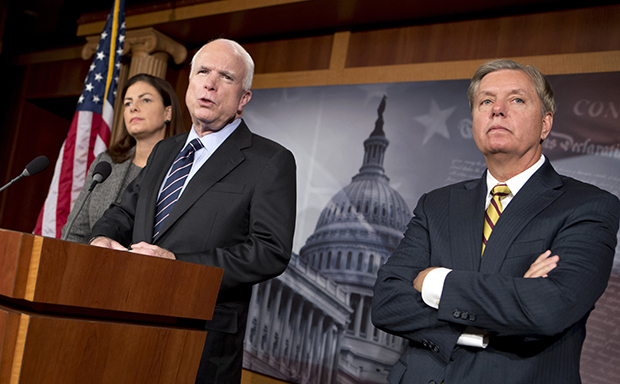 John McCain of Arizona and Lindsey Graham of South Carolina? Their crude act has done little good and a lot of harm to the reputation of the party with black voters. “The image of a party of angry old white dudes going after an accomplished black woman will not give them the image makeover they need,” blogger David A. Love wrote for TheGrio.com. So far, the tepid approach to solving the GOP’s black-and-brown issues is what I call the “Bobby Jindal Solution.” By promoting its growing roster of elected officials with minority or ethnic heritage, such as Jindal, the Louisiana governor, some in the Republican Party seem to believe that a dark face is the only necessary solution to selling unpopular policies in nonwhite communities. Virginia Gov. Bob McDonnell, former head of the Republican Governors Association, embraces that concept, bragging recently that his party is actually more diverse than Democrats, if you judge by counting governors. “They have I think two women and minorities,” he told reporters covering the association’s recent meetings. “We have seven. And, so, we’re not keeping score but the point is that the people that are coming in. I doubt such Machiavellian moves will succeed. If for no other reason, the just-completed election offered a glimpse of the future for African American and Latino politics in a browning America. What’s more, Republicans shouldn’t continue to be their own worst enemy. The strategy to win over minority voters should be to lure them, not repel them, with programs and priorities. Indeed, Republicans shouldn’t again plaster a colored face on bad policy and mean-spirited rhetoric. Ask former Florida Rep. Allen West, a Republican and Tea Party darling who lost his seat after one term in Congress, how that worked out for him.